Trim ends off zucchini and squash and grate them using a food processor. In a large bowl, toss zucchini and squash with 1 teaspoon coarse salt and set aside for 10 minutes. Wring out the water of the vegetables. You’ll be surprised by the amount of liquid that will come out, but this will prevent your fritters from becoming soggy. Return the zucchini and squash shreds to bowl. Add more salt if you think it needs. Stir in the scallions, parsley, cilantro, egg and some freshly ground black pepper. In a small bowl, stir together flour and baking powder, then stir the mixture into the vegetable batter. In a large heavy skillet heat 2 tablespoons of oil over medium-high heat until shimmering. Drop small bunches of the vegetable mixture onto the skillet only a few at a time so they don’t become crowded and lightly nudge them flatter with the back of your spatula. Cook them over moderately high heat until the edges underneath are golden, about 3 to 4 minutes. Flip the fritters and fry them on the other side until browned underneath again, about 2 to 3 minutes more. Drain on paper towels then transfer to baking sheet and then into the warm oven until needed. If using the topping, stir together the sour cream, lemon juice, zest, salt and garlic and adjust the flavors to your taste. Dollop on each fritter before serving and enjoy! 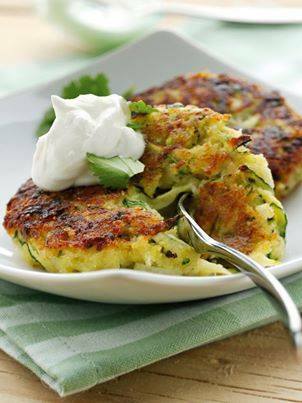 These fritters keep well, in the fridge for the better part of a week, so that you can enjoy them for breakfast the next morning. When you’re ready to use them, simply spread them out on a tray in a 325 degree oven until they’re hot and crisp again.